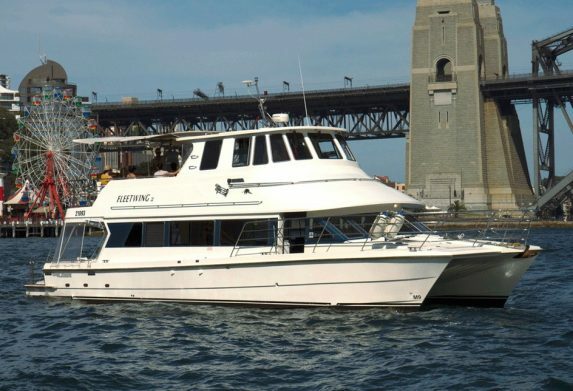 Fleetwing is a 53-foot luxury motor catamaran well suited for your next corporate or private boat hire function. Available now at Anyboat, Fleetwing is large enough to accommodate 46 guests comfortably for cocktail or buffet style charters or 16 guests for seated dining. Being a catamaran, Fleetwing is designed with stability in mind. Your next boat hire function, be it for a work Christmas party, product launch or a hen’s and party is sure to be an enjoyable one. Ideal for entertaining, Fleetwing has a spacious interior and undercover rear deck that will not disappoint. On those beautiful, sunny Sydney days, you and your guests can make full use of the upper deck and exposed front deck and soak in all that Sydney Harbour has to offer. Fleetwing has an on board BBQ and comes with multiple BYO and catering options. Equipped with a swim ladder, you and your guests can go for aswim in Sydney Harbour's sparkling water or just mingle on board and make full use of the spacious interiors and modern stereo system with iPod connectivity. Be sure to contact our helpful staff at Anyboat and enquire about Fleetwing for your next boat hire event, new years eve cruises or christmas cruises.